The route is clockwise. The course will be well marked with swim buoys and you will complete 1 lap for the sprint distance and 2 laps for the standard distance. After completing your correct number of laps, you will head for the swim exit marked by flags. The 5km bike loop will be completed 4 times for sprint distance athletes and 8 times for standard distance athletes. It is your responsibility to count your own laps. We find the best way of doing this is with the aid of a bike computer or watch. Starting from the transition area, triathletes will run either 1 or two out and back loops, alongside the lake. The course is on pavements and is completely flat. There will be 1 drinks station on the course, manned by marshals serving water in plastic cups. This is the only drinks station and you will pass it on each lap. 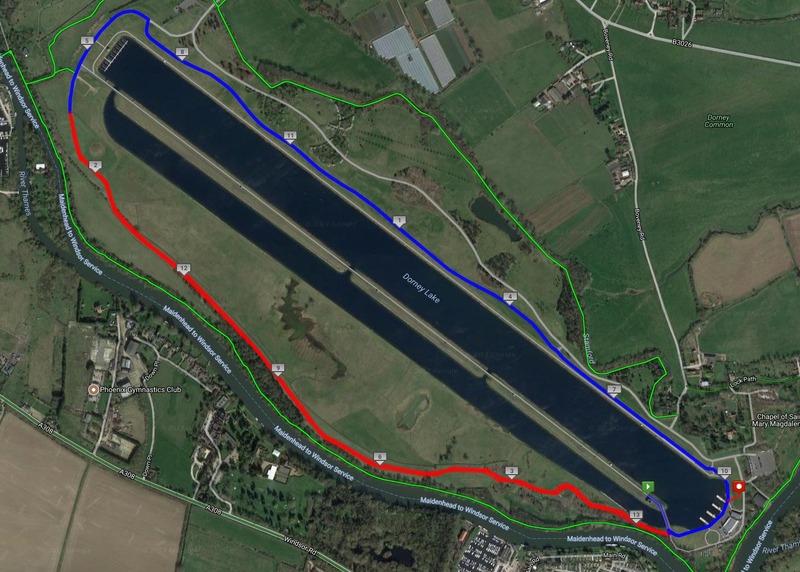 Dorney Lake is ideally placed being within easy reach of London, Heathrow Airport, the M4 corridor and the M3, M25 and M40 motorways. It is well served by the rail network with main stations being Slough, Maidenhead and Windsor. Taplow and Burnham train stations are also nearby. There will be free parking for all participants next to the event village and start and finish! Main stations for Dorney Lake are Slough and Windsor & Eton Riverside. Burnham, Taplow and Maidenhead stations are also nearby. The temperature of the lake is taken on the morning of the event and if it is over 14 C then wet-suits will be optional. If the temperature is over 22 C then wet-suits will not be allowed. Please don’t email us if wet-suits will be allowed at the race, as we can’t tell you this information until the temperature is taken on race day. You are free to wander around the lake so you can see where the competitors will be running. It is lapped so you will see them on numerous occasions. Normal BTF (British Triathlon Federation) rules apply. All these rules are important but the most important of these is that all competitors must secure their cycle helmet (on their heads!) before removing their bike from the rack and must not undo or remove it before racking their bike at the end of the cycle section. You must also fully comply with and follow all rules of the Highway Code. Our primary consideration is your safety, make it yours as well! The Half Marathon course has a strict 3-hour time limit! Really excellent event. This was my first standard distance tri and as a beginner I really appreciated the simple layout. I can also appreciate the more experienced triathlete would like that it's an opportunity to push pace and times. Very enjoyable run and everything was organised well. It would be nice if there was another water station possibly 2 more. Otherwise everything was well organised, and staff were very helpful. Hi There, is the 8th of June sold out? Hi there, not sold out yet so you can still book on! Think I am not going through to the correct link but it keeps saying 8th September when trying to book 8th of June. Hi there. Apologies for the confusion - the link has now been updated. Enjoy the event!